Sunday is Father’s Day in Canada, a celebration I shunned growing up as much as I dreaded Valentine’s Day until I finally had a girlfriend. Both days were lousy reminders that I didn’t have what others were celebrating. 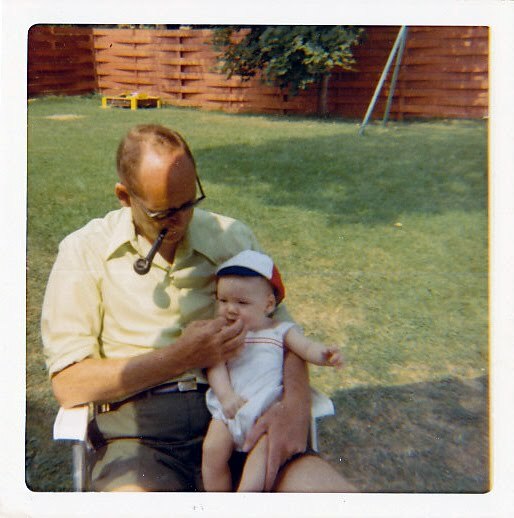 However, while Valentine’s Day was just another lousy day (mostly in my late teens and early twenties), Father’s Day was a reminder, every year, of a life I could have shared with my father. One sunny morning in 1973, my brother and I were eating breakfast in the kitchen and my mother called to my father, who was in bed, asking if he wanted anything to eat. The rest is a blur: my mother going to the bedroom, hearing her scream, and my brother and I running to see. The last image of my father was of him being carried out to the ambulance. He suffered a heart attack. As a three year-old, I did not fully comprehend what took place. Shortly after his death, I would hear my mother talk on the phone to her friends about what happened. As she would be talking, I would suggest to her to go buy a new daddy from the store, thinking that a mannequin in a store window would serve as a replacement for my father. I remember her smiling when I said that. Father’s Day at school meant writing a card for an uncle I saw twice a year, while everyone else wrote a card for their fathers. It just wasn’t the same. As I grew older, my mother would tell me stories of my father that helped me understand who he was. A joker, always wanting to make others laugh; an artist, self-taught and with a passion for painting animals, boats, and winter scenes; a volunteer firefighter for our tiny town of Roxboro; and someone who was quite content with staying close to home and never travelling farther than a 2-hour drive away. And of course, she would tell me the story of when they first met, and how she was the one who tripped him. It’s too much of a stretch to say I really remember my father; only a handful of memories, more like fleeting images, snapshots of the past. Growing up without a parent, sorrow was inevitable. Anger, once present in my teenage years and directed towards an uncaring god, faded over time. And eventually, acceptance seeped in. As my own impending fatherhood approached, I greeted it with trepidation, not knowing what to do. My mother had reminded me over the years that she was both a mother and a father to me, but still…it’s not the same. I had no father figure to model. Over the years, my on-the-job training as a father has been filled with joy, and at times challenging, rewarding, frustrating, and overwhelmingly awesome. The hugs my boys assault me with at the end of my workday are akin to the maniacal rush that Dino launches into as he slams Fred Flintstone every night coming home from work. I am fortunate. So my basement is sometimes messy, my lawn is not always meticulously cut, my car hasn’t been washed since last year, and the last time the windows were washed…well, I can’t remember. But my children have taught me to play, because they know what’s fun, and I’ve discovered a second childhood through them. Plenty of people out there will tell you how to be a good parent, and make sure that, in all actions as a parent (to paraphrase the Convention on the Rights of the Child), the best interests of the child have to be of primary consideration. Spending time together with my children is, to me, doing just that. I don’t remember ever playing with my father, but I’m trying to make up for lost time now.